Behold! Homemade Pumpkin Spice Bourbon. Like my coconut vodka, this was insanely easy to make. All it took was regular pumpkin pies spices–cinnamon, ginger, nutmeg, and clove–bourbon, and time. The result is bourbon with a tasty pumpkin pie undertone and a nice lingering finish. Great for sipping and for cocktails too. Combine all spices and the bourbon in a glass jar. Put the lid on and shake thoroughly. Let sit for 3 days and taste. If you’re happy with the spice flavor, line a colander with a cheese cloth and strain the bourbon through to a clean jar or bottle. The cheese cloth will collect any extra spices from the bourbon. Yes please! 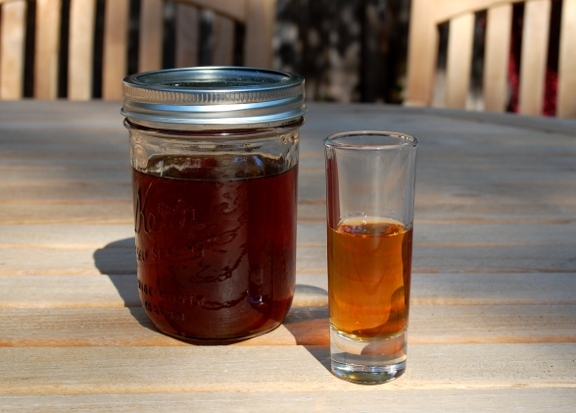 Spiced amber liquors are such a great plan for fall & winter. Doing this tonight in prep for the weekend. Any ideas on how to drink it (other than straight up)? I typically make manhattans with my bourbon. CJ, I’m going to try it in a Manhattan and put the results up in a week or so. I’m 90% sure it would be delicious. It would also work great in an Old Fashioned or with some apple cider/apple juice shaken with ice. Hope that helps! Well, I started mine last night. Got a bottle of Jim Beam Devil’s Cut, and made a whole bottle worth since I didn’t have anything else to keep it in other than the bottle. I would guess this would be perfect for splashing into hot cider. Last week I made a brown butter bourbon (fat washing makers mark with brown butter and cinnamon). I can imagine this being an interesting spin on that recipe – sort of a pumpkin spice butterscotch. Well, the manhattan was ok (2parts bourbon, 1 part martini rossi rosso, and a couple of splashes of angostura bitters), but not my favorite. It was really great as a sort of old fashioned. I took a teaspoon of sugar, soaked it with bitters, poured in 2 shots of the bourbon and added a few ice cubes. Very very good this way! The spices really give you a warm feeling as you drink a few. Also tried a shot in some cold apple cider with ice. Hot cider may have been a little better, but it was pretty damn good. CJ, thanks for the “research.” Sounds like it was successful. That’s interesting about the Old Fashioned–I’ll have to try it!